A juniper shrub can be used to form a boundary in a garden, covering unsightly areas of your property, or filling in bare places behind other more colorful plantings. Unfortunately, juniper can also turn into a mess of dead wood and brown needles if it isn’t cared for regularly. To fix a juniper shrub on your property that has seen better days, take some time in early spring to clean up the plant and leave a lush, healthy-looking plant behind. Look toward the center of the juniper to spot any dead limbs with brown needles. Untangle the dead limb from the rest of the plant and hold it extending outward. Cut the dead portion off with the pruners, just after a point where a healthy branch forks off from the main limb. Keep looking for and cutting away the dead branches until the majority of the juniper has a green color to the needles, without any major signs of dead growth. Step back from the juniper to get a feel for the shape of the plant, since untangling may have changed the overall shape of the shrub. Check it over to get an idea of which branches are jutting out from the body of the shrub and distorting its shape. Cut back the branches that stick out too much, to just above a fork similar to step one, but you don’t need to cut far into the shrub. This cut is just for shaping, not to get rid of the branch entirely. Clip off just the tips of the fresh, green shorter branches to encourage lateral growth and fullness of the shrub. You don’t want to create a flat, box-like look as with other shrubs, but allow the juniper to retain a natural appearance. Use the loppers if any of the branches you need to cut are larger than 1 inch in diameter, so you don't ruin your pruners. Repeat pruning annually, cutting out dead branches as you notice them, but always keeping the natural shape of the juniper in mind. 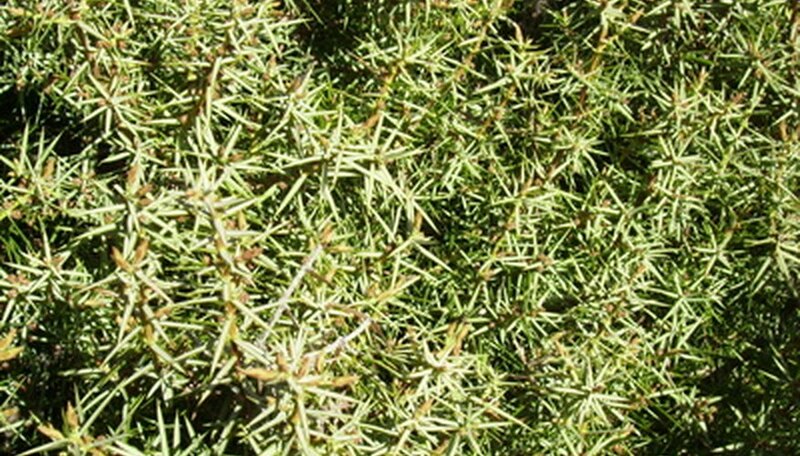 Wear long sleeves and gloves as you work to keep the juniper's needles from poking into your skin.